Between our RV and car we cover a lot of miles across the US. And if you watch my instagram feed while we’re on the road you know that we LOVE trying regional food! 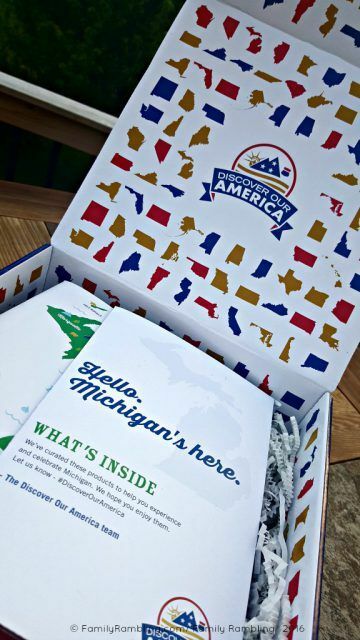 So it was a no-brainer when Discover Our America asked if I wanted to try their new state-themed monthly subscription box. Be sure to read clear to the bottom for a special savings just for Family Rambling readers! 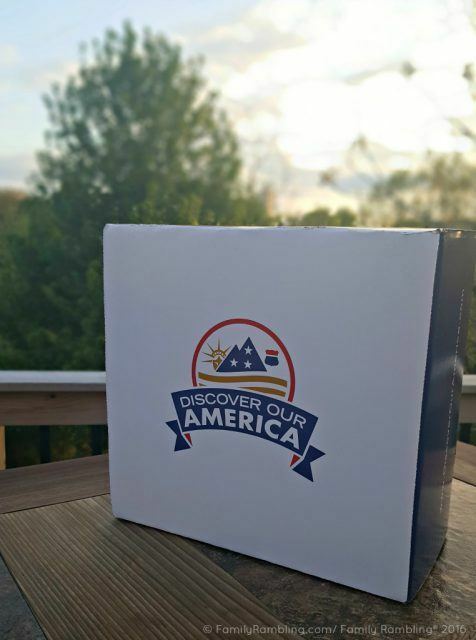 What Will You Find in the Discover Our America Subscription Box? 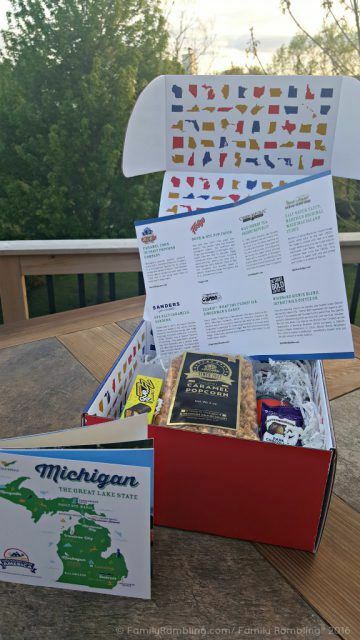 Designed to bring the flavor of each state right to your door- no travel required!- each Discover Our America box will include food, goodies, and a lovely booklet filled with state facts and beautiful photos that will have you adding another state to your ‘must visit’ list. And the first state is…. Michigan! No peeking! On top of your products you’ll find a fun pamphlet letting you know what’s inside as well as a lovely booklet with an overview of the state. What a fun box! We’ve traveled through Michigan in the past but a few of these products were new to us. It was such fun to pull out each treat, read the description, and see where it was from. I have to admit that everything but the beverages didn’t last too long! This was a really fun ‘taste of Michigan’ and I’m excited to see what the next few months will bring. Boxes can be purchased as a monthly subscription or past months can be purchased as a ‘stand alone’ product to re-experience or send as a gift. 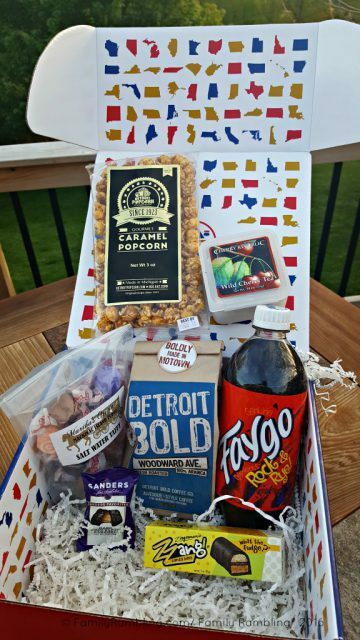 Each box has 5-7 goodies curated from the featured state. What do you think of this new subscription box idea? Will you give it a try? Also- where are you from and what do you think should be in your state’s box? Living in Iowa I think something involving bacon is necessary in my state’s box! I love this idea and I know our boys would love it too as they loves to try new and different things that we don’t normally have around here, so I’ll be looking into this! Thanks for the tip! I would have been all over that caramel popcorn! I’d be curious to try it and see what the Iowa box has in it. Bacon would definitely be good! Maybe some Templeton Rye snuck in there, too? Wishful thinking, I know!